, younger brother of the preceding, was born Oct. 21, 1674, at Postling in Kent, the vicarage | of his father, who bred this son also to the church. He was sent to Corpus Christ! college, Oxford, in 1690, where he soon distinguished himself by his uncommon abilities, and extraordinary advances in classical literature. He took the degree of M. A. in 1696, and commenced author the same year, by the publication of his “Romas Antiquae Notitia, or, The Antiquities of Rome; in two parts; 1. A short History of the Rise, Progress, and Decay of the Commonwealth. 2. A Description of the City an Account of the Religion, Civil Government, and Art of War with the remarkable Customs and Ceremonies, public and private with Copper Cuts of the principal Buildings, &c. To which are prefixed, Two Essays, concerning the Roman Learning, and the Roman Education,” in 8vo. 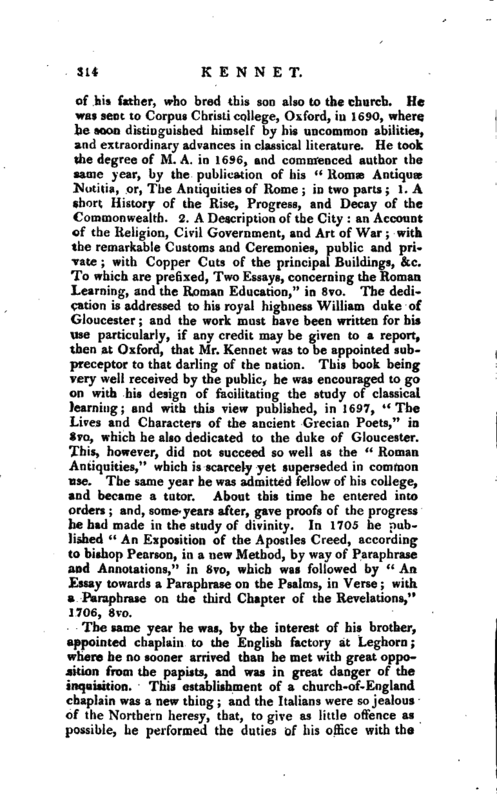 The dedication is addressed to his royal highness William duke of Gloucester; and the work must have been written for his use particularly, if any credit may be given to a report, then at Oxford, that Mr. Ken net was to be appointed subpreceptor to that darling of the nation. This book being very well received by the public, he was encouraged to go on with his design of facilitating the study of classical learning; and with this view published, in 1697, “The Lives and Characters of the ancient Grecian Poets,” in 8vo, which he also dedicated to the duke of Gloucester. This, however, did not succeed so well as the “Roman Antiquities,” which is scarcely yet superseded in common use. The same year he was admitted fellow of his college, and became a tutor. About this time he entered into orders; and, some years after, gave proofs of the progress he had made in the study of divinity. 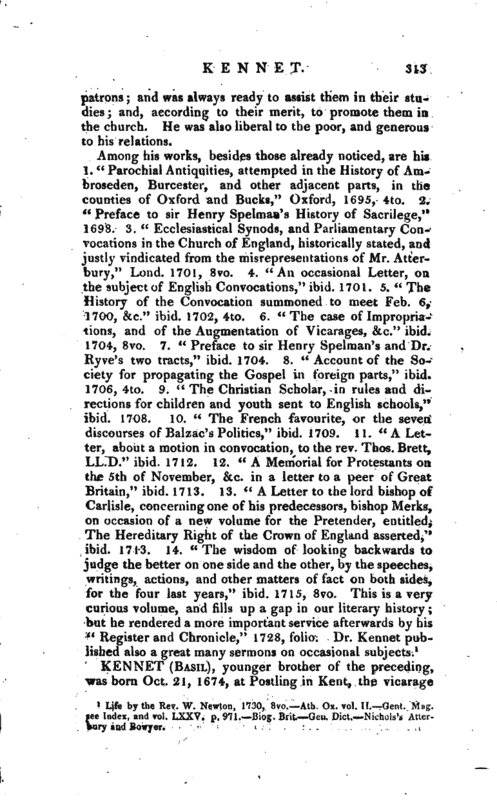 In 1705 he published “An Exposition of the Apostles Creed, according to bishop Pearson, in a new Method, by way of Paraphrase and Annotations,” in 8vo, which was followed by “An Essay towards a Paraphrase on the Psalms, in Verse; with a Paraphrase on the third Chapter of the Revelations,” 1706, 8vo. The same year he was, by the interest of his brother, appointed chaplain to the English factory at Leghorn; where he no sooner arrived than he met with great opposition from the papists, and was in great danger of the inquisition. This establishment of a church-of-England chaplain was a new thing; and the Italians were so jealous of the Northern heresy, that, to give as little offence as possible, he performed the duties of his office with the | utmost privacy and caution. But, notwithstanding this, great offence was taken at it; and complaints were immediately sent to Florence and Rome. Upon this, the pope, and the court of inquisition at Home, declared their resolution to expel heresy, and the public teacher of it, from the confines of the holy see; and therefore secret orders were given to apprehend Mr. Kennet at Leghorn, and to hurry him away to Pisa, and thence to some other religious prison, to bury him alive, or otherwise dispose of him in the severest manner. 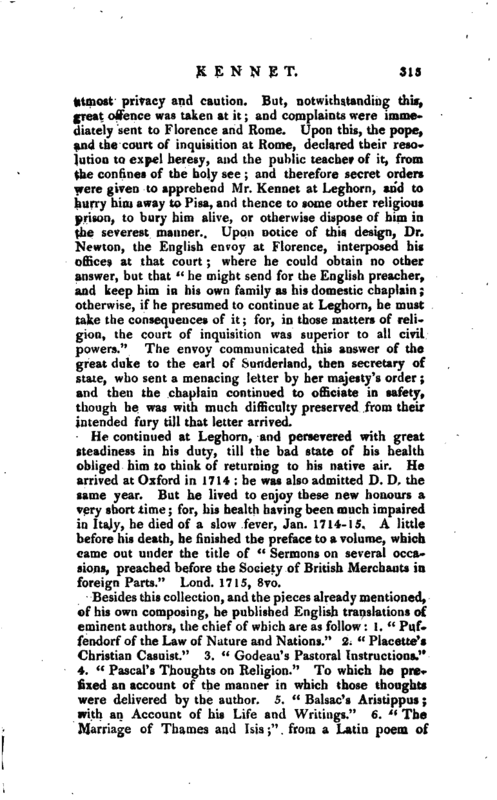 Upon notice of this design, Dr. Newton, the English envoy at Florence, interposed his offices at that court; where he could obtain no other answer, but that “he might send for the English preacher, and keep him in his own family as his domestic chaplain; otherwise, if he presumed to continue at Leghorn, he must take the consequences of it; for, in those matters of religion, the court of inquisition was superior to all civil powers.” The envoy communicated this answer of the great duke to the earl of Sunderland, then secretary of state, who sent a menacing letter by her majesty’s order; and then the chaplain continued to officiate in safety, though he was with much difficulty preserved from their intended fury till that letter arrived. He continued at Leghorn, and persevered with great steadiness in his duty, till the bad state of his health obliged him to think of returning to his native air. He arrived at Oxford in 1714: he was also admitted D. D. the same year. But he lived to enjoy these new honours a very short time; for, his health having been much impaired in Italy, he died of a slow fever, Jan. 1714-15. 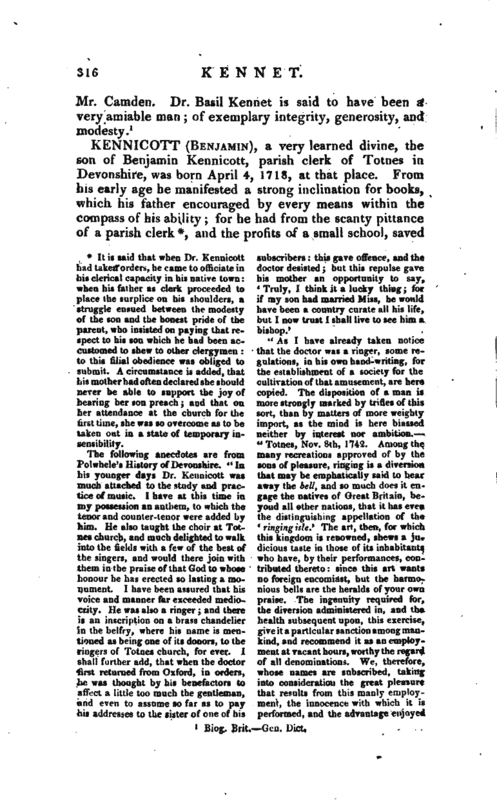 A little before his death, he finished the preface to a volume, which came out under the title of “Sermons on several occasions, preached before the Society of British Merchants in foreign Parts.” Lond. 1715, 8vo.